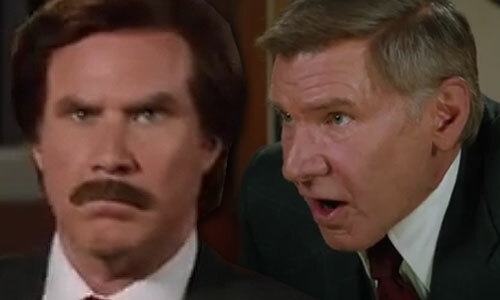 Two ANCHORMAN 2 trailers in the same day? Actually, it’s not that uncommon to have an International trailer released at the same time as an American trailer, but thankfully this UK clip has a lot of different footage than what we’ve already seen, including our first shot of Harrison Ford in the film. It’s been almost 10 years since ANCHORMAN came out, and ANCHORMAN: THE LEGEND CONTINUES hits just in time for Christmas. Will Ferrell is back as Ron Burgundy, joined by original ANCHORMAN cast members Steve Carell, Paul Rudd, David Koechner, Vince Vaughn and Christina Applegate. Newcomers include Jim Carrey, Harrison Ford, Sacha Baron Cohen, James Marsden, Kristen Wiig, John C. Reilly, Meagan Good, Kirsten Dunst and Nicole Kidman… whew! What a cast!! Adam McKay returns to the director chair, and co-wrote the screenplay with Farrell. This all comes after a rather premature teasing a year ago with a rather cryptic teaser trailer, but at least they followed through with various promotions and a more fuller trailer. Now you can check out yet another new look in this International trailer and tell us if you’re anxiously awaiting more wacky adventures with Ron Burgundy.